well February seemed to come and go...just me? surely not! but i can honestly say that i enjoyed it more than January. we had various family events going, started training again, and have had overall more 'me' time (no it is not selfish. i am a priority). this month i managed to get through these three books and all of them were high on my 'to read' list. with Vicious ended a series i have been reading for years! Shepard has dragged me up and down and all around with these books and she finally gave me closure. while they are geared towards a younger demographic (ugh feeling my age! ), i never got around to reading them when i was younger and i am glad i waited because there was no way i could have waited years for this series to end! suspenseful! 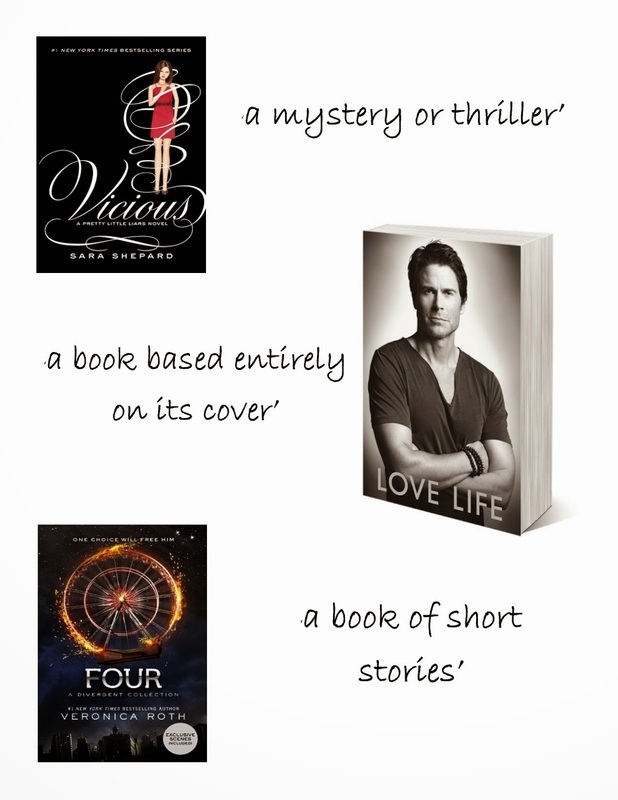 then there is 'a book based entirely on its cover', Love Life with a giant picture of Rob Lowe on it. need i say more? but honestly this book was great, and so was his other one. i like his style of writing and how he describes a person and his interaction with them but doesn't say their actual name until he drives it home with a final line and you're left like wtf? love it! and finally Four. i read the Divergent series last spring break so i thought it appropriate that about a year later to the date i pick up this compilation of short stories to fill in the gaps. i'm glad Roth further developed the character because at times his sensitivity really got to me. now in a week i will be on vacation for Spring Break and hope to get some good reading time in. i am still aiming for 52 books this year and am very behind, but i will not apologize to myself for actually having a life that i love.